In a healthy person, inflammation is a good thing. It’s your body’s natural response to harm. When you hurt yourself, become infected, or are exposed to harmful bacteria, the body’s immune system floods the affected area with blood as your body starts to repair itself. For an unhealthy person, however, inflammation can be a problem. Chronic inflammation is when areas of your body are inflamed for an extended period, sometimes lasting weeks or months. Typically, it occurs when your body cannot cure what initially caused the inflammation or when the immune system attacks healthy tissue, mistaking it for harmful pathogens. Chronic inflammation can be quite painful and is associated with a number of serious health conditions. It can even lead to some cancers. So simply put, inflammation needs to be regulated. Diet plays a big role in fighting off chronic inflammation. Eating sugary, fatty foods often helps promote chronic inflammation. However, most food that’s good for you can actually help to fight inflammation. A healthy diet helps improve inflammation by regulating insulin response and providing the essential nutrients and antioxidants your immune system needs to fight against inflammation and repair itself naturally. Here are some of the top foods that offer superior anti-inflammatory benefits. Fatty Fish: Some of the best food for inflammation is fatty fish like salmon, mackerel, tuna, and halibut. These options are rich in omega-3 fatty acids like DHA and EPA, which help lower inflammation in a couple of ways. First, fat is central to creating prostaglandins in your body, which are inflammation-regulating compounds. Good fats, like omega-3s, have positive effects on the proliferation of prostaglandins, while poorer quality fats, like saturated fats, have the opposite effect and contribute to inflammation. Omega-3 also lowers “bad” LDL cholesterol and triglycerides, which are both known to contribute to inflammation. Blueberries: Is there anything these delicious berries don’t do? Because of their high bioflavonoid content, this popular fruit packs an antioxidant and anti-inflammatory punch that’s tough to beat. Antioxidants work to fight inflammation by their ability to heal cells, support immunity, and limit cell-damaging free radicals. If you prefer something a little more tart, cherries are also a great anti-inflammatory because of their anthocyanin content. Turmeric: Eating curry is another great (and delicious) way to fight inflammation. Turmeric not only gives curry its yellow color, but it also offers a heap of bioflavonoids. Furthermore, it’s been reported that turmeric puts the brakes on NF Kappa B, which is a protein that triggers inflammation and can lead to flare-ups. Eat more curry and you can stop inflammation in its tracks! Whole Grains: Whole grains, such as oats or whole grain bread, are good for inflammation because they lower bad cholesterol and offer a great source of fiber. 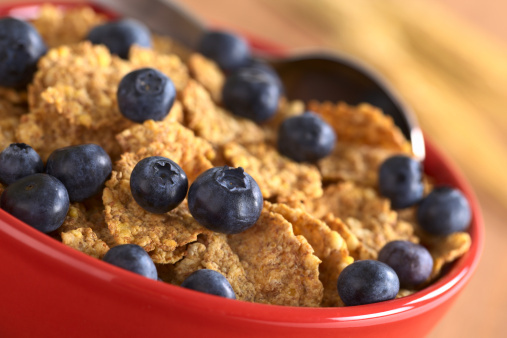 Furthermore, a study in the American Journal of Clinical Nutrition indicated that whole grains lower C-reactive protein, which is produced in the liver and rises in response to inflammation. The study reported people who ate whole grains saw a 38% drop in C-reactive protein compared to those who ate refined grains. Staying away from sugary, refined foods is a good way to fight the pains and problems associated with inflammation. By cleaning up your diet and trying to include the items mentioned above, you can fight inflammation in a natural way that promotes good health. Lin, G., et al., “Curcumin Inhibits Tumor Growth and Angiogenesis in Ovarian Carcinoma by Targeting the Nuclear Factor-kB Pathway,” Clinical Cancer Research web site, 2007; http://clincancerres.aacrjournals.org/content/13/11/3423.long, last accessed August 22, 2014. Katcher, H., et al., “The effects of whole grain-enriched hypocaloric diet on cardiovascular disease risk factors in men and women with metabolic syndrome,” American Journal of Clinical Nutrition web site, 2008; http://ajcn.nutrition.org/content/87/1/79.full?sid=6cf9f129-f082-4f81-aa2e-6cdb52872c63, last accessed August 22, 2014. Fetters, A., “8 Foods that Decrease Inflammation and Help You Lose Weight,” Women’s Health web site, August 18, 2014; http://www.womenshealthmag.com/weight-loss/anti-inflammatory-foods, last accessed August 22, 2014.